Are you an aspirant looking for jobs in the government sector? Here is an opportunity for you from the Vector Control Research Center! They have opened the recruitment process for filling 56 vacancies for the posts of Technical Assistant, Technician – 1, Lab Attendant – 1, Staff Car Driver (Ordinary Grade). The last date for your application to reach to the office is on 15th April 2019. The mode is offline so make sure your documents reach the office within the time, if not it will get invalid and will be considered. You may be eligible if you are below the age of 28 and hold a degree, you may check the official notification for the exact details of the educational qualification. 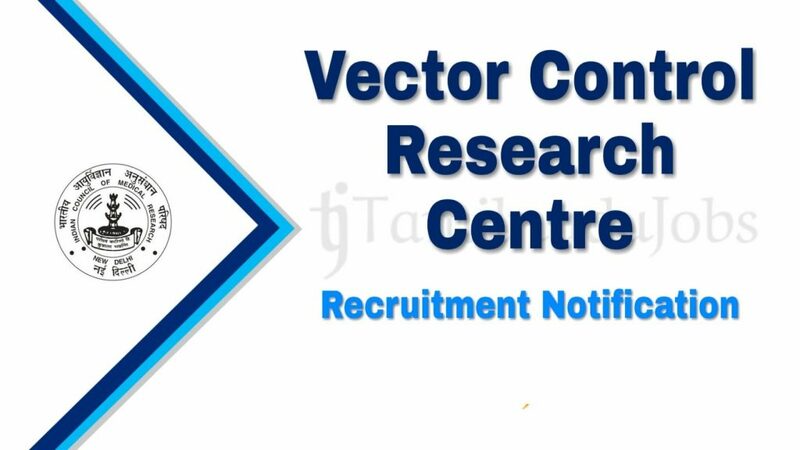 The selection process for VCRC Technical Assistant Recruitment 2019 and other posts will be based on the interview only. Keep looking at the website to further information regarding the job and upcoming vacancies. Offline: by demand draft in favor of “The Director, ICMR-VCRC, Puducherry”. Step 3: Look for the right notification “Applications are invited for Technical and Driver posts as ICMR-VCRC, Puducherry, up to 15/04/2019” and click on that. Step 5: when you are interested and eligible to apply you may now down the application and fill the details. Look for the required documents to be attached and attach them with the job application. Step 6: send them to the mentioned address. Make sure you attach all the documents and demand draft (if necessary) and also make sure that the documents reach the office within the last day, 15th April. (For complete process you may look at the official website).